This is an 1830's gown 1/2 drape that I did earlier this past semester. 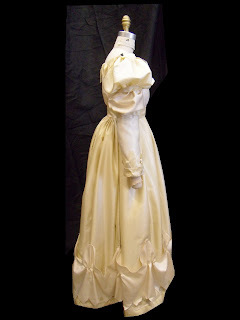 It is based on a gown from Janet Arnold's book (see picture at top). With this drape, I used antique satin instead of the usual muslin to drape it, which was quite a challenge! The satin has a very different drape quality - it is a bit springy and slippery, but definitely interesting to work with. It's also fun to have some color! I feel like the waistline could still be a bit higher and the petticoats could be fuller/stiffer to fill out the skirt shape more, but all in all I'm really happy with how this drape turned out. It was a big challenge to get all the trim in and figure out how it all worked. I also got to learn how to do cartridge pleats in the back (see close up picture). Yay! The 1830s is sort of a neat transition time within the Victorian era. The gowns are moving from that simple, "Greek" style, high waisted look of the early 1800s into a stiffer more controlled silhouette. Right now we see that the waist is still high but it is making it's way back to the natural waistline. There is more form to the skirt and it is getting larger. Decorations are getting more elaborate. The sleeves are large and create a very horizontal look at the shoulders. 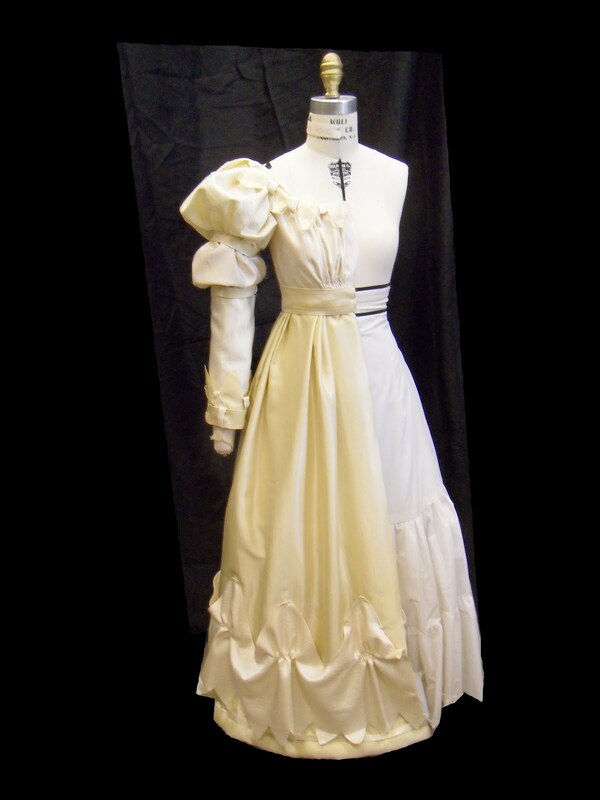 We will then be moving into even larger and wider sleeves and skirts and the age of the crinoline!